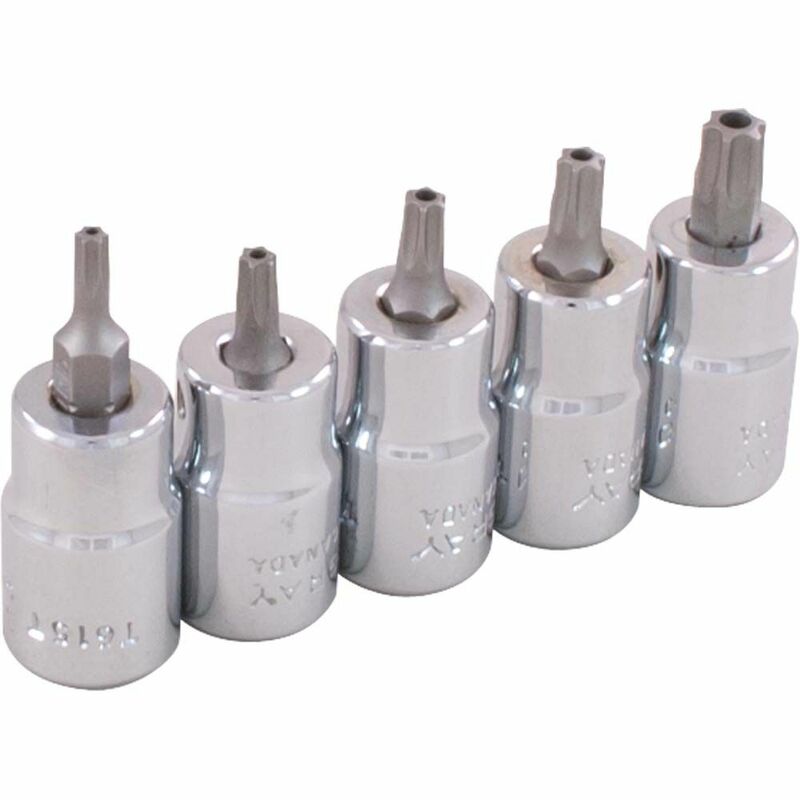 The sockets in this 5 piece 3/8" drive tamper resistant Torx<sup></sup> head socket features a precision tip ensuring a tight and secure fit with the fastener. The exact fit reduces likelihood of fastener stripping or rounding. The chromed socket has outstanding corrosion resistance as a result of our proprietary in-house plating process. Made in Canada and backed by Gray Tools worry-free lifetime warranty. Contains Sizes: T15, T20, T25, T27, T30. 7-Piece 3/8 in. Drive SAE Hex Bit Socket Set is made of chrome vanadium steel for long-lasting wear. The Bit Sockets feature a chrome finish for excellent resistance to corrosion. The chamfered lead-in on the Drive end is for quick and easy placement onto fasteners. 10-Piece 3/8 in. Drive 6-Point Metric Deep-Well Socket Set is made of chrome vanadium steel for strength. The finish provides resistance to corrosion. Chamfered lead-in provides quick and easy placement onto the fastener. 10-Piece 3/8 in. SAE Socket Set has a wide range of Sockets that can address a variety of needs. The Sockets have a fully polished chrome finish. Case included for easy storage and carrying. Socket Set Torx Head 5 Pieces 3/8 Inch Drive Tamper Resistant The sockets in this 5 piece 3/8" drive tamper resistant Torx<sup></sup> head socket features a precision tip ensuring a tight and secure fit with the fastener. The exact fit reduces likelihood of fastener stripping or rounding. The chromed socket has outstanding corrosion resistance as a result of our proprietary in-house plating process. Made in Canada and backed by Gray Tools worry-free lifetime warranty.